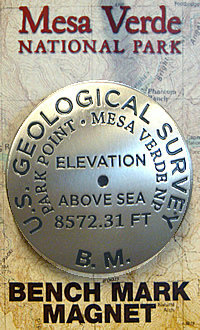 This three-dimensional, acrylic magnet, is a visitor favorite. 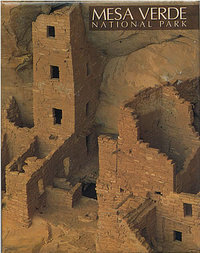 Features a stunning photograph from George H. H. Huey, of Cliff Palace, the crown jewel of Mesa Verde National Park. The balcony prominently featured in this photograph is a unique architectural detail that provided access to the upper rooms of the dwelling. 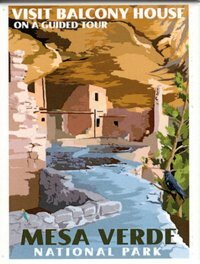 Aptly named, Balcony House offers the most adventurous ranger guided tour at Mesa Verde National Park. This vibrant magnet from the Retro Ranger Collection by Impact, is reminecent of artwork from the Works Progress Administration (WPA) era. 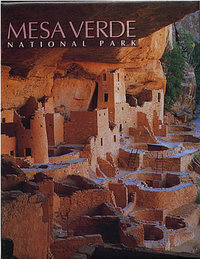 This beautiful image of Cliff Palace at dusk, is a sure way to treasure and remember your visit to Mesa Verde National Park. 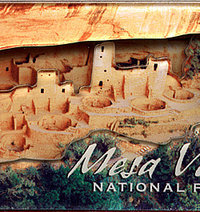 Made in the USA, this panorama magnet offers a nearly complete view of the iconic Cliff Palace, the largest and best preserved cliff dwelling in Mesa Verde National Park. 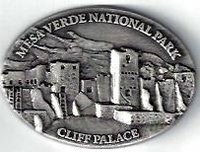 This oval-shaped pewter magnet features a three dimensional, diecast image of the iconic Cliff Palace. The image on this colorful magnet is a fusion of geometric shapes resulting in a multihued print of Cliff Palace. This wonderful image demonstrates the impressive size of Long House which fills an expansive 298-foot long sandstone alcove. Evidence suggest Long House was home to up to 175 people and also provided a public space for trading and community events. 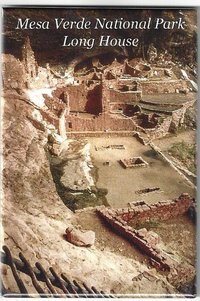 This stunning image features one of the kivas and courtyards at Spruce Tree House that was reconsturcted in the early 1900's so that visitors could gain a sense of what kivas and courtyards were like. 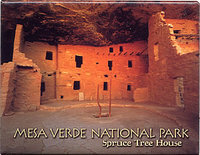 The prominent tower of Square Tower House is a four story, 28' tall structure, unlike any other tower in Mesa Verde National Park. 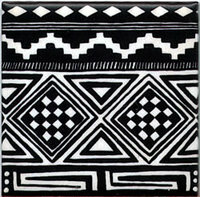 Ceramic tile inspired by Mesa Verde Black-On-White pottery designs featurig a checkerboard pattern. 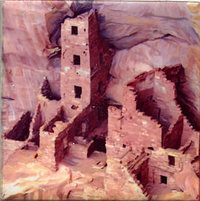 Ceramic tile heat set with a photograph of Cliff Palace, the largest and most impressive cliff dwelling at Mesa Verde National Park. 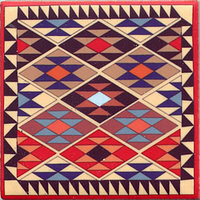 Ceramic tile with a Germantown, "Eye-Dazzler" Navajo weaving inspired pattern, heat set into a special coating for long-lasting enjoyment of the artwork. 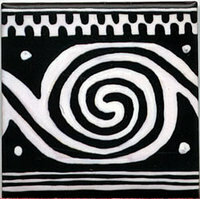 Ceramic tile inspired by Mesa Verde Black-On-White pottery designs featurig a spiral motif. 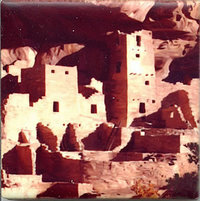 Ceramic tile heat set with a photograph of Square Tower House, the tallest cliff dwelling at Mesa Verde National Park. 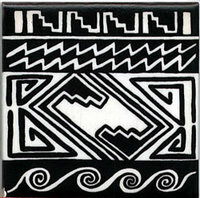 Ceramic tile inspired by Mesa Verde Black-On-White pottery designs featurig interlocking spirals, stepped diamonds, and narrow lines. 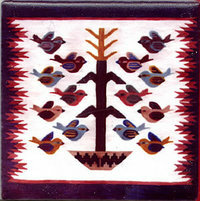 Ceramic tile with a contemporary, "Tree of Life," Navajo rug inspired pattern heat set into a special coating for long-lasting enjoyment of the artwork. 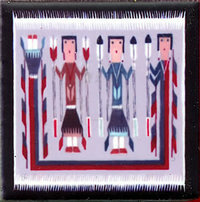 Ceramic tile with a contemporary, "Yei" Navajo rug, inspired pattern, heat set into a special coating for long-lasting enjoyment of the artwork.